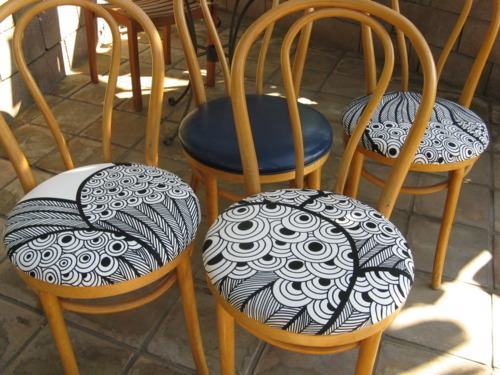 'm working on the next DIY project — hopefully for use in a staging we're doing tomorrow through Friday… 1/4 of the way through on recovering my $8 bentwood chairs with IKEA Saralisa fabric. I found them yesterday at Salvation Army. They have these really ugly blue leatherette seats, so I figured they don't need a coat of paint, but they could sure use fabric. Had to fight a guy who wanted to buy the whole set of eight. I convinced him to buy four and let me have the other four. It worked!